What are the top help desk calls received by the help desk from the customers they support? We pulled together the top 10 help desk calls with specific recommendations. While you cannot prepare for every question, there are some industry standard high volume questions. These questions must be prepared for by documenting the most probable support steps that will resolve the issue. This documentation of steps should be place in the help desk knowledge management system. The knowledge management system should be used and improved overtime by help desk agent feedback on if the support steps worked. Help desk agent training is also important especially when the training is focused on the top 10 help desk calls and issues received by the help desk team. Training should cover how to find the answer in the knowledge system, how to apply the solution, and what to do if that solution does not solve the problem. Part of training is to have experienced help desk staff provide coaching during and after live help desk calls. Help desk calls about password unlocks and resets are the most asked question of any help desk. One way companies are enforcing security is by requiring its employees to use complex passwords. Complex passwords are passwords that are greater than eight characters, includes numbers and special characters, and have not been used as a password recently. Complex passwords are a good security measure but this complexity is causing users problems remembering their password. Help Desks see a high help desk call volume of password issues in the mornings, after a weekend, after a holiday and after a change to their old password. So as a help desk manager what can you do? Staffing levels – You should map out your help desk call volume patterns and staff appropriate during the high volume periods such as Mondays and mornings. To staff up during these high volume morning periods and avoid over staffing during lower afternoon periods you have to be creative. Many staff may be open to flexible shift hours and there may also be part-time workers. Skill based help desk call routing – By using an Interactive voice response (IVR) system users can identify they need password assistance by keypad or voice. Help desk agents can be assigned into skill based groups. Password are generally the simplest type of support issue. so you can assign lower skilled and less costly help desk agents to the password support skill group to handle the password support call. This will reduce costs per call and keep your highly skilled agents available for more complex issues. Self-service password reset solution – This is a system that allows a user to reset their password from a web browser without calling the help desk. This will reduce the volume of help desk calls and reduce overall long-term costs. This also improves the productivity of a user by averting unnecessary and prolonged wait time for a help desk agent during high call volume periods. A slow computer is a symptom of a larger issue. While there are many solutions to this problem, the help desk agent should be coached how to handle this in a logical problem solving manner. Establish a timeline of when it started to slow down. Was it this morning or last week? Establishing a time line can help you troubleshoot. For example, if it started yesterday you can look at a potential virus, new application installed, recently applied security patch or change in user behavior. If it has been occurring for a longer period of time, it could more hardware or system related. 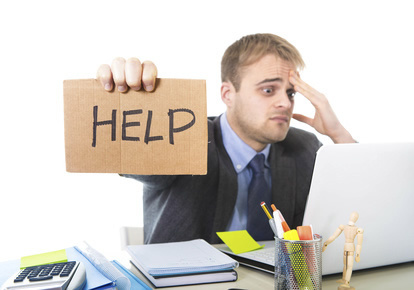 Help desk calls related to printer issues can be challenging since there are three variables which could be the culprit. These three main variables are the printer, the computer and the application. It is important to create a knowledge article to assist the help desk agent in troubleshooting. I like to start troubleshooting from the printer and work back to the application. Is the printer powered up, online and not displaying any errors such as a paper jam? Is it a locally attached printer and are the cables connected? Is it a network printer and can anyone else print to it? Is the printer installed on the computer, is it the default printer and what is the status? When did it last print? Have you every printed with this application and is the correct printer selected? In addition to password, slow computer and printer issues, the following seven questions are frequently asked of the help desk. I can’t get my mobile device to sync my emails – This is a frequent problem for mobile device users that can be frustrating. Configuration and syncing problems can result in mail not being updated, calendar meetings not up to date and problems with your contacts. The internet/network is so slow – Users have a good idea when things are not working the same as the day before. If the network or Internet seems slow, they will contact the help desk. When the help desk is answering these calls they should have up to date information if there is any network or Internet web content filter issues. If there are, help desk management should post a front end message on the help desk phone system to alert users as they call. Also the help desk agents should receive an outage or issue notice so they can save time troubleshooting. My application is not working – Application support can be the most challenging type of call since most help desk have hundreds of application they offer support for. The best way to ensure your help desk agents are able to solve a high percentage of application support calls is to have a good knowledge base full of solutions. The solutions should be searchable by application name and error codes. Many successful knowledge base solutions will have a main landing page for each major application and then have links to specific issues/solutions from that landing page. I have deleted some files, can I get them back? – Users can have many issues related to lost or deleted files. It is important that users receive training and guidance on proper ways of saving files to the network before they have a problem. Many companies will back up and be able to recover files stored on a network drive. If the user is missing files from a local drive, recover may not be an issue. How do I connect my mobile device to the guest network? With most employees and visitors having their own mobile devices, your company needs a policy for guest wireless access. Most companies offer guest wireless access, which is not connected to the internal network and company resources. In most cases access is secured by a password and/or certificate to control access. The website I need is blocked – Many companies use web content filters to limit users from accessing potentially harmful websites. Make sure your help desk has a way to submit a customer request to unblock a website. The important thing to remember is to provide your help desk agents a good troubleshooting script and proper training for issues. It is also important to document the actions taken into a ticket for future calls or if deskside support is needed. Ensure the help desk agents receive training and access to a robust knowledge base with best practices. Document all information received from the customer and support steps into the help desk ticket for future reference.